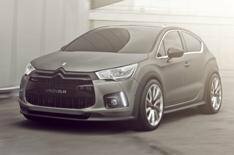 Geneva motor show 2012: Citroen | What Car? Citroen will unveil nine new or updated models at the Geneva motor show 2012. The line-up includes the DS4 Racing Concept, a high-performance version of the DS4 that's likely to be produced in limited numbers. The DS3 Ultra Prestige - a luxurious version of the DS3 supermini - will also be there. New Paris Rendez-Vous limited editions of the DS4 and DS5 also make their debut at Geneva. Both variants of the Paris Rendez-Vous are available with pearlescent white paint and come with chrome door mirrors and trim, as well as black diamond-effect alloys. Inside, both models are finished with brown watchstrap leather trim and blue overstitching; a matching leather finish for the dashboard is an optional extra for the DS4. The DS3 Racing S. Loeb a new limited-run version of the DS3 Racing gets its first outing at Geneva, with 200 cars planned for production. The exterior comes in a textured matt black wrap, with red roof, grille, door mirrors and dashboard detailing. Each example of the DS3 Racing S. Loeb will be individually numbered and signed. The C3 Red Block which first appeared at the Geneva motor show 2011 has been confirmed for production and will be at this years show. This version gains stiffer, lowered suspension and stability control. Itll be available in two shades of grey, as well as blue, white and black. All cars come with black door mirrors and handles. Inside, the Red Block gets gloss black dashboard trim and aluminium door surrounds and pedals. The steering wheel diameter has been reduced by 20mm, while red leather upholstery is available as an option. Another car making its Geneva debut is the C4 Aircross a compact SUV based on the Mitsubishi ASX. There's also the chance to see two face-lifted models - the 2012 C1 and 2012 Berlingo Multispace, both of which have updated looks and more efficient engines.